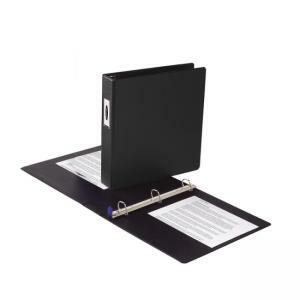 Wilson Jones Locking D Ring Binder - 4"
Single-Touch Locking D-ring Binder features a cover made of tough vinyl material. Durable material wears well, no cracking and tearing. Exclusive Locking No-Gap D-Rings are designed for simple, convenient assembly of your materials, opening and closing quickly with a simple touch. Locking mechanism assures the rings will stay aligned to prevent papers from falling out, even when fully loaded. Both inside covers are equipped with Pocket Guards. Spine offers a label holder sleeve for quick identification.